Straight From the Coconut's Mouth, Coconut Water. I talk a lot about coconut water. I also talk about how shockingly delicious fresh coconut water is. But most people don't know where to get fresh coconut water! You may have seen these white coconuts wrapped in plastic wrap in your grocery store. All you need is a small hole for a straw. Use a sharp knife to, with one swipe, poke a hole. Chop it as you would an apple-only harder. You don't need to use the tip of the knife. 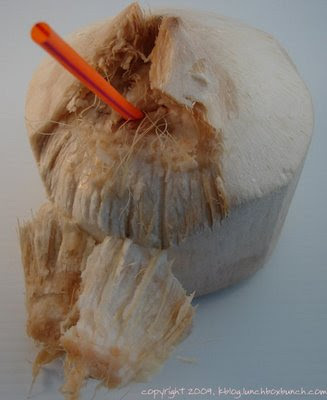 Just a sliver-slice can create a hole for a straw. A few angled swipes at the same spot on the coconut works well too. PS. The tetra pack coconuts like ZICO, Vita CoCo and ONE are also very good substitutes for a straight-from-the-coconut water. I like my tetrapaks half frozen. Super cold! Tastes like a Icee or slushee that way.